Naval History & Heritage Command photo NH 98489. Aaron Ward was born at Philadelphia, Pennsylvania, on 10 October 1851. Appointed to the Naval Academy in 1867, he was graduated in June 1871 and assigned to USS California on the Pacific Station for the next two years. He then had duty with the Hydrographic Office in Washington, DC, punctuated by brief service in USS Brooklyn from late 1873 to February 1874. During 1875–1876 Ward, now with the rank of Master, served on the European Station in USS Franklin. His next assignment, at the Naval Academy in 1876–1879, was followed by service in the training ships New Hampshire, Portsmouth, and Saratoga that lasted until mid-1883. Lieutenant Ward was ashore at the New York Navy Yard and at the Torpedo Station, Newport, Rhode Island, for two years. He went to the Pacific Station in 1885 in USS Hartford and remained there in USS Iroquois and USS Monongahela until mid-1889. Lieutenant Ward had Naval Attaché duty in Europe during the first three years of the 1890s, was an officer in the cruisers New York and San Francisco into the middle of the decade and then was assigned to the New York Navy Yard. During the Spanish-American War in 1898 he commanded the gunboat Wasp and was executive officer of USS Panther for the next year. He was promoted to the rank of Lieutenant Commander during this time. From the end of 1899 until September 1900 he served in the Far East, mainly as Assistant Chief of Staff and Aide to the Asiatic Station's commander. Ordnance duty followed at the New York Navy Yard, accompanied in September 1901, by promotion to Commander. Early in 1902 Ward returned to Asiatic waters, where he commanded the gunboats Yorktown and Don Juan de Austria. After further work at the New York Navy Yard, Captain Ward was Chief of Staff to Commander Asiatic Fleet and, from March 1907 until May 1908 was commanding officer of armored cruiser Pennsylvania. 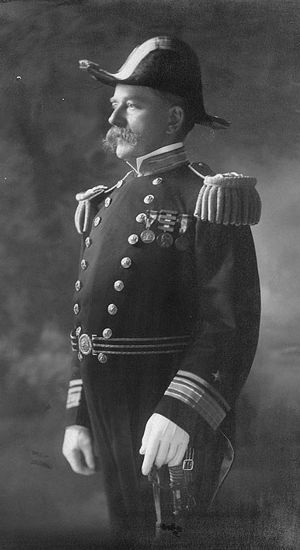 Serving ashore at New York and Washington, DC, for the next three years, he was promoted rear admiral in January 1910. From April 1911 until August 1912 he commanded divisions of the Atlantic Fleet, flying his flag in the battleships Minnesota and Florida. His final year of active service was spent at New York. Retired in October 1913 upon attaining the age of 62 years, Rear Admiral Ward died 5 July 1918 and was buried at Brooklyn, New York. Source: Naval History & Heritage Command including Dictionary of American Naval Fighting Ships.